The world’s forests are under pressure. Tropical forests are disappearing fast due to commercial logging, mining, hydropower, and the hunger for land. The last temperate and northern old growth forests are being destroyed by the timber, paper and oil industries. The livelihoods of forest peoples are being undermine and every year thousands of plant and animal species disappear. This forest loss contributes around 20% of global carbon dioxide emissions annually and the climate change debate has brought the plight of the remaining intact forests back into the spotlight. But will the new approaches discussed in the climate context reflect the lessons learned from two decades of failed initiatives to slow deforestation? Resurgence article. 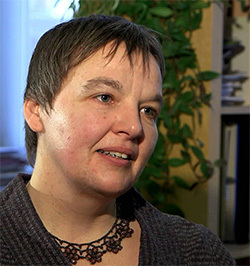 Jutta Kill, is Climate Campaigner with FERN, a non-governmental organisation which works to achieve greater environmental and social justice, focussing on forests and forest peoples’ rights in the policies and practices of the European Union. Her formal education is in forest ecology, and she has worked as climate campaigner for FERN since 2000 and is co-founder of the Durban Group for Climate Justice. FERN’s climate campaign has contributed significantly to the Durban Group critique of carbon trading as an unsuitable instrument to tackle climate change in a just and effective manner, and has become a leading voice in exposing the failings of carbon ‘offset’ schemes via the website SinksWatch and proposing just and effective alternatives to offset trading. Since 2005, FERN’s climate campaign has begun to document and analyse the impacts on local livelihoods of EU biofuel targets and why such an approach is likely to exacerbate the forest crisis and delay meaningful action towards a climate-proof transport and energy policy in the EU.